What is Pisto? Basically, pisto is the Spanish version of ratatouille (boiled vegetables), and this is one of my friend's favorite pisto Spain dishes. It sounds very simple about how to cook pisto, but like most of simple dishes in Spain, there is delicious version and terribles one. numbones.com finally found a trick to make the most delicious 'Spanish Ratatouille' Pisto Murciano. The trick, as usual, is the quality of your spanish ratatouille ingredients and your extra olive oil. Also the care you take when stewing the vegetables. Try my delicious pisto murciano recipe, the Spanish version of ratatouille! Peel and cut the vegetables into cubes as shown. And then put the eggplant on the tissue then sprinkle with kosher salt. Leave it like that for at least 10 minutes. Put two different frying pans over medium heat and add a little olive oil to each frying pans. Put the sliced onion to one of the pan, and add a pinch of salt on it. Stir with medium-low heat until it turns transparent, then cover the pan and let it boil (but don't let it too long, always check every time). Once fully cooked, serve it in a large bowl. Meanwhile, add the peppers to another pan and stir over medium high heat until it turn browned. Lower the heat to medium and cover it for about 10 minutes. After cooked through, then serve along with the onion. Rinse the salt from the eggplant in the net filter. Follow the same steps as the pepper to cook zucchini and eggplant (in a separate pan). Cook them on medium high heat, and after starting turn to brown, reduce the heat and cover until soft (also keep stirring several times so that it doesn't stick). Then serve it with other vegetables, mix them to make all the flavor merges. Add all the spices to a bowl of vegetables and mix them well. Next, add a little bit of oil to one pan if necessary, and add the sliced garlic (and the dried cayenne pepper if you using it). Stir with medium heat until it start to fry. Then add the peeled and sliced tomatoes into the pan. Cook on medium low heat for about 20 minutes, and keep stirring it frequently until it become tomato sauce. Then add some sugar and salt. Mix the previous cooked vegetables with the tomato sauce on large frying pan. Last, mix everything well, and cook all of the for 10 minutes over medium heat. Adjust some salt and spices, and enjoy! 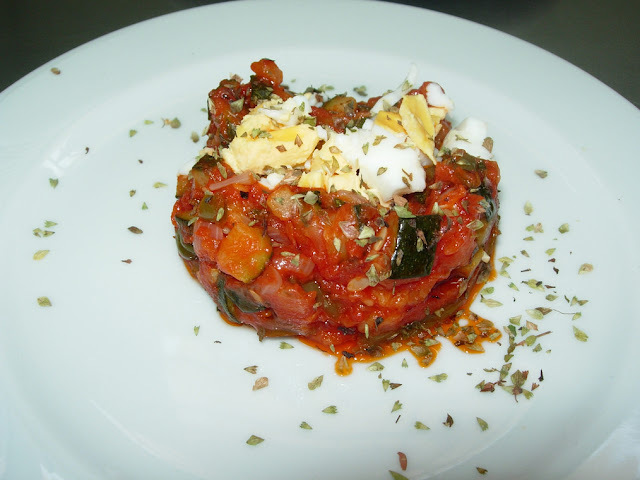 The spanish ratatouille with egg are ready to serve! The most famous Pisto Spanish Dishes are pisto con huevo (spanish ratatouille with egg) or pisto Manchego (pisto with Manchego sliced cheese on top). Both are great ways to enjoy pisto as food, or you can serve it as a fish or meat dish. Besides this popular recipe, I have also posted another Spanish food recipes. Like Jamon, Pisto, Salmorejo, Tortillas and Croquettes. If you have some free time, you can try making those delicious Spanish recipe. Because those recipe are included in the Best Spanish foods. Besides the tastes is delicious, those spanish food is also easy to make. You can even make it with simple equipment in your home. And after trying a lot, I thought that this is the best 'Spanish Ratatouille' Pisto Murciano Recept I've ever made, but if you have one that you like, please leave a comment for me! I always want to experiment. What do you think? Will you be try my Pisto Spanish Ratatouille recipe soon? 0 Response to "How to Make 'Spanish Ratatouille' Pisto Murciano"